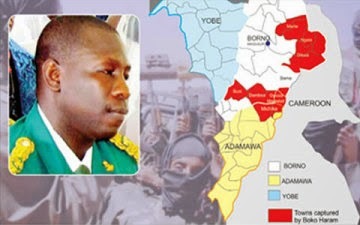 Lieutenant-Colonel Adeboye Obasanjo, who was caught by shots fired by the Boko Haram sect during exchange of fire in Bazza town of Michika Local Government Area, has expressed his desire to return to battle front once he is certified fit. The son of the former Nigerian leader, Chief Olusegun Obasanjo, said this on Tuesday, when former Vice President, Atiku Abubakar, paid a visit to him at Federal Medical Centre in Yola, Adamawa State. Mr. Atiku was quoted as telling of his joy at Mr. Obasanjo’s high spirit. He reportedly told the recuperating officer that his display of courage can be rightly associated with his father, ex-President Obasanjo. Similarly, Adamawa acting governor, Ahmadu Fintiri has saluted the courage and steadfastness of all officers of the Nigeria Army currently battling to curtail the activities of insurgents in Adamawa and entire Northeast. He gave the commendation when he visited Lt. Col. Adeboye Obasanjo. Mr. Fintiri was received at the hospital by the Chief Medical Director, Aliyu Danburam, who said Mr. Obasanjo was recuperating and in stable condition.